What I would have given to have lunch with Ann Curry yesterday! I'd even have bought said lunch. I mean, I'd probably have to, seeing that I have a job and well, you know, Ann doesn't. Now neither does her former co-host. I shant be buying his BLT and fries. 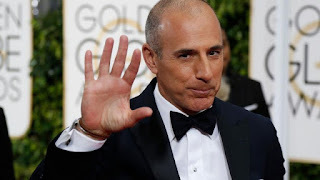 Not that I've talked to many people about Matt Lauer's seemingly swift fall, but not one of them was surprised in the slightest, present company included. Besides being a fair-at-best interviewer (totally totally totally let pre-BLOTUS skate), he just seemed skeevy. I mean, didn't his actions get some Today show news person relocated to the west coast after it was rumoured he fathered her kid....or kids? NBC's self-coverage was quite pathetic. Savannah Guthrie (is there anyone in TV "news" more milquetoast than that chick?) was lamenting about her friend...........oh, and her colleague who had the courage to stand-up. Oh yes, the victim came in second, at best. Make no mistake. Guthrie tried to pull off, almost word for word, what Sarah Silverman said two weeks ago about Louis CK. Tried, as in: attempted. Attempted, as in: failed. But she was not the only one who failed in the broadcast. The NBC reporter and Lester Holt walked a high wire saying it was the first allegation against Lauer. But the televised report mentioned several complaints years past with which were said to fallen. I believe that they believe an incident report to NBC News and ones NBC human resources are two different horses of two different colours, so Lester can say with a straight face: "the single occurrence". Matt. Louis. Harvey. Charlie. Roy. Bill. Roger. What is it with men who feel the need to expose themselves to women - in some semi-planned event............in the office? Of course, it's the transgendered folk we have to look out for in bathrooms. To be fair - these guy just did it at the office. All work and no play make Matt/Louis/Harvey/Charlie/Roy/Bill/Roger dull boys. It also makes them unemployed boys. I'm thinking the soon to be ex-Mrs Lauer is breathing a sigh of relief. She probably put up with all that philandering because of the annual $20 mill. coming into the joint account. Since that gravy train won't be pulling into the station anymore, she may as well get her 50% and get out. Of course, I love Matt interviewing Bill O and discussing how O'Reilly, even being the #1 guy a FOX would have to be let go because the allegations were true. Rose did the same thing about everyone else's stories. Did they really think: "oh, they don't mean me!"? I just have to believe that Al Roker is just sweating bullets at this point. That kind of behaviour in that kind of work environment doesn't go unnoticed.....and Savannah knows it. I bet Ann knew it too - which is why Lauer had her canned. I bet Katie will do some talking. My hopeful silver lining of all this exposure, such as it is, will have a trickle-up theory. Maybe, just maybe, assholes like BLOTUS will get their comeuppance for their past, current and future behaviour. So as the blog image suggests - 'bye Matt. ....and good riddance. He won't be missed. You can be sure there is some real dirt on him out there. Did he get Ann fired? I, too, was disgusted that Savannah Guthrie mentioned Lauer first, and expressed her sorrow at his firing, and then, almost as an after thought, the bravery of the victim[s] coming forward. I watch CBS morning news show and would have never in a million years thought that Charlie Rose would do such a thing. But hey, men are like that when they have power. They never think for one minute that they will get caught or the woman will have the guts to speak up.